All surgery patients experience pain, 100% of them. The question is, how can we most effectively block that pain? The science behind pain, how it is perceived, and how it is blocked, is deep and complicated. 1. There is a big difference between unconsciousness (anesthesia) and pain control (analgesia). Just because you are asleep when the painful stimulus happens does not mean the pain will be under control when you wake up. With Pre-emptive, Multi-modal Pain Management, we start to control pain well before the surgery ever begins. For Dogs, we start hours before surgery by giving a nerve medication called gabapentin, which both reduces anxiety as well as calms the nervous system in preparation for surgery. Next we give an injection of a potent opioid pain medication, similar to morphine or Demerol. Combined with this are doses of a medication that acts on a spinal level to further block pain and another tranquilizer to relieve pre-op anxiety. 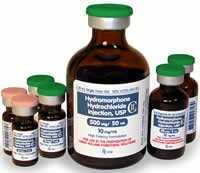 During surgery we use local anesthetics at the incision site, kind of like the dentist, to further block pain. In addition, the patient’s IV fluid bag is fortified with two medications that act on a spinal level to further dampen the pain response. Post-Op, the patient gets a two doses of gabapentin the night of surgery and the morning after for it's anti-anxiety effects and it's pain control effects. And finally, the patients are also started the evening of surgery on the ibuprofen-like take-home pain medication. Cats are similar, but the program is modified to suit their unique metabolism. As you can see, this is a lot different (in a good way) from just getting some take-home pain pills. Rest assured, it is realy very safe. Because we use multiple medications, we are able to use lower doses of each so that we get all the beneficial effects while minimizing the adverse effects. This type of pain management also allows us to use very low doses of our primary anesthetic, resulting in much more stable blood pressures during surgery. Pre-emptive, Multi-modal Pain Management is much, much better than just taking some pills after surgery. All this only adds about $32 to the cost of the procedure. We recommend it because of the increased pain control, comfort, and stress relief it provides. Click here to go to a page about how to tell if your pet is in pain.